Last week, while on vacation, I was lucky enough to be quoted in an article in The Real Deal regarding the NYC tech startup scene. As I mentioned in the article, the NYC tech startup scene is really booming. I'm personally working with several tech startups and I'm tracking about 150 more that are growing in the city. Quirkily named Internet startups were dominant in last month's Super Bowl advertising. Initial public offerings for these companies have recently been splashed throughout the business pages, and Wall Street analysts are valuing some of them in the range of tens of billions of dollars. Then, of course, there's the gorilla in the room, Google's recent $1.9 billion purchase of 111 Eighth Avenue. These days it seems you can't escape that eerily familiar sense that we are back in the throes of another tech bubble. 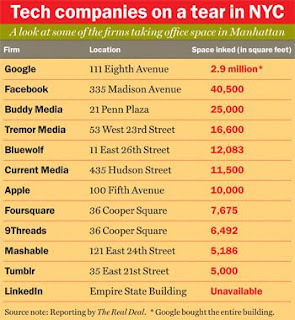 And a recent spate of commercial leasing deals in Manhattan involving technology firms -- ranging from titans like Facebook and LinkedIn to upstarts like BuddyMedia, Foursquare and Tumblr -- suggests that they are on something of a real estate tear. "It seems like in the last year it has really exploded," said Grubb & Ellis associate Michael Mandel, who at the age of 28 was not around -- professionally speaking -- for the tech boom that took place 10 years ago. "People used to think of Silicon Alley as an afterthought, but now it is really coming into its own." A quick rundown of recent leasing activity that has taken place over the past six months proves that Mandel may be right. In June, the social media firm Foursquare increased its footprint at 36 Cooper Square, taking over the entire 7,675-square-foot sixth floor. In October, the online publishing platform Tumblr signed a 5,000-square-foot-deal at 35 East 21st Street. Also in October, Tremor Media, a video advertising company, signed a 16,600-square-foot lease at 53 West 23rd Street. Meanwhile, Buddy Media, a social media marketing company, signed for 25,000 square feet at 21 Penn Plaza. Mashable, a social media news website, signed for 5,186 square feet at 121 East 24th Street in August and is already looking for more space, according to one source. And the list goes on: Bluewolf, a "cloud computing" and new-media consulting firm, signed a lease for 12,083 square feet at 11 East 26th Street in November; Al Gore's Current Media signed for 11,500 square feet at 435 Hudson Street; and 9Threads, a technology-focused firm that does strategic marketing for fashion, beauty and retail marketers, just signed for 6,492 square feet, also at 36 Cooper Square. That's not to mention some of the more high-profile deals, like Facebook's 40,500-square-foot lease at 335 Madison Avenue and Apple's recent 10,000-square-foot deal for more office space at 100 Fifth Ave.
Déjà vu? Possibly. But a closer look at the current tech company expansion in New York shows it to be more restrained than what was seen in the early aughts. "I wouldn't say it is blowing up," said Newmark Knight Frank's executive vice president and principal Paul Ippolito, who was on the front lines of the tech-leasing bonanza that lasted from 1998 to 2002. "I would say there is a strong stream of activity, but it is a lot different than 10 years ago," he added. "People are more conscious and more conservative about taking on real estate prior to the business being there. It is more of a solid foundation." Ah, yes; think back 10 years ago, when start-ups like Kozmo.com, the online delivery service, took on hundreds of thousands of square feet of office space in its quixotic anticipation of explosive growth and profits. Yet after blowing through $250 million in funding, that three-year-old company shuttered in 2001. New tech firms are taking less space than their predecessors -- mainly in the four- and five-figure range, which is markedly less than the six-figure square footage that was the norm in the previous boom. Mike Kaufman -- partner at Kaufman Organization, which recently brokered deals on behalf of the video advertising firm Brightroll, as well as Apple -- said this time around, both landlords and the tech companies themselves seem to have learned a few lessons. Nowadays, according to Kaufman, a 14-year industry veteran, landlords aren't willing to lease to any start-up technology firm that just puts up the largest security deposit, as was the norm in the past. In addition, the tech companies are actually growing their office footprint commensurate with their own growth. "The difference between then and now is that then, everyone was funded and no one knew what they did," he said. "Now there is a genuine business model, with a clear path to profitability with an actual service or a product." Other than Facebook (at 335 Madison) and LinkedIn (at the Empire State Building), which are in Midtown proper, most of the activity is taking place in the less expensive Midtown South. Tech firms are still predominantly interested in creative space, with its signature wood floors, high ceilings, and exposed brick -- the types of spaces that first came on the market in the early 2000s. According to Newmark's Ippolito, Brooklyn and Manhattan's Far West Side are also generating a fair amount of interest and activity. WebMD recently moved to the Google building at 111 Eighth Avenue, while the online art clearinghouse site Etsy has set up shop in Dumbo.